Medal Winners - Saving the world from bad baking. I am very excited to announce that I won my first Gold Medal at this year's show for my Hazelnut & Raspberry Friands! My Flourless Orange & Almond Cake won it's second Bronze Medal and my Mini Fruit Mince Pie received a Bronze this year as well. Great results this year for Sugarplum Bakery with two Silver Medals and one Bronze. Silver for Hazelnut & Raspberry Friands as well as Mini Fruit Mince Pies, Bronze for the meringue style almond and chocolate Beekeeper Biscuit. Medal at this year's Bread, Cake and Pie Competition. The ever popular Beekeeper Biscuit - a macaroon style treat with caramelised almonds and Lindt chocolate won its third Bronze Medal as well as the Flourless Orange & Almond Cake, which was submitted for the first time this year. Email Brigit to order some medal winners now. 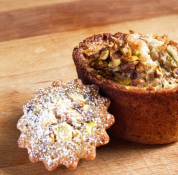 Our delicious Pistachio & Rosewater Friands was awarded a Silver Medal in 2013 and a Bronze Medal in 2012. 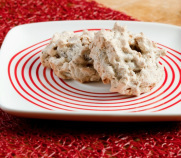 "Beekeeper Biscuits" - a meringue style biscuit with Lindt Chocolate and almonds. Don't miss out, order some now! Pistachio & Rosewater Friands are made with a mix of pistachios, hazelnuts and almonds. The rosewater gives them an exotic fragrance which is balanced by the roasted nuts. The flourless Orange & Almond cake is a popular gluten free option for morning or afternoon teas, cafes and cake stalls. $35 per loaf.